Drain Bags: Drain Bags Come With A Reinforced Hanger With Built-In Anti-Kink Drain Tube Guide. 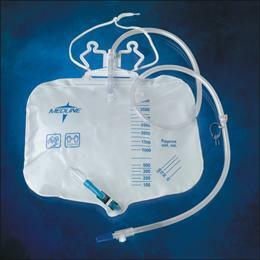 50" Of 11/32" Star Tubing Facilitates Drainage Of Thick, Fibrous Urine While Resisting Kinking. Adjustable Bed Sheet Clamp Secures Tubing And Needleless Sample Port That Is Accessible With Either A Blunt Cannula Or Needle.2000Ml Capacity, 20 Each Case. Continuous Bladder Irrigation Drain Bag. 4000Ml Capacity, Anti-Reflux Tower, Drainage Port With Metal Clamp. Packaged O.R. Sterile In Tyvek Peel Pouch..